“O people of Iraq! Listen to me and do not make haste to kill me so that I may tell you what I must, and appraise you of the reason for my coming to Iraq. If you accept my excuse, believe in what I say, and behave towards me fairly, you will level for yourselves the path of prosperity, and then you will have no reason to kill me. And even if you do not accept my excuse and deviate from the path of justice, you must ponder over the pros and cons of the matter before you kill me, and should not undertake such a delicate task rashly and without deliberation. My supporter is the Almighty Allah Who has revealed the Qur’an. Allah guards His deserving slaves. O people! Identify me and see who I am. Then you will come to your senses and reproach yourselves. You should reflect carefully whether it is permissible for you to kill me and to disregard the reverence due to me. Am I not the son of your Prophet’s daughter? Is the wasi (vicegerent) of your Prophet and his cousin and the first person, who expressed belief in Allah and confirmed what was brought by His Prophet, not my father? Is the Doyen of Martyrs Hamza bin Abdul Muttalib not the uncle of my father? Is the martyr Ja’far bin Abu Talib who has two wings and flies with Allah’s angels not my uncle? Have you not heard that the Holy Prophet has said about me and my brother: “These two sons of mine are the chiefs of the young men of Paradise”. If you think that whatever I am saying is true so much the better. I swear by Allah tht I know Allah hates the liars, and I have never told a lie. And even if you do not believe in my words and refute me, there are still some companions of the Holy Prophet amongst you who, when asked, will apprise you of the facts. Ask Jabir bin Abdullah Ansari, Abu Sa’id Khudari, Nahl bin Sadi, Zayd bin Arqam or Anas bin Malik, so that they may tell you that they have heard these words from the Holy Prophet about me and my brother. Is this tradition itself not sufficient to restrain you from killing me? If you are doubtful about this tradition can you doubt even this that I am the son of your Prophet’s daughter? I swear by Allah that between East and West there is no son of the daughter of a Prophet except me either amongst you or amongst others. Tabari writes that in reply to the Imam they said: “We did not write any letter and are not aware of what you are saying.” Truly speaking it is the height of meanness and foul play that the same persons who invited their Imam by means of a large number of letters and had signed those letters, were replying to him with utmost impudence that they had neither written any letters to him nor invited him! Here we introduce to the readers one of those mean persons so that they may come to know to what extent one can go on account of worldliness and lack of will-power. They appear before the people in one guise today and in another guise tomorrow. One day they draw their swords for the sake of Allah and on another day against Him. If they are friends of Ali on one day they become his enemies on the following day. One day they kill Imam Hussein and on another day they claim to be the avengers of his murder. Shabath bin Rabie i.e. the very person who was the Commander of the Iraqi army on the day of Āshura and one of the killers of the Imam was at one time the mu’azzin of Sajāh and he accepted this office when she claimed to be a prophetess in the tribe of Bani Tamim. However, when Sajāh was disgraced he embraced Islam. He had also a hand in the murder of Uthman. Then he became one of the followers of Ali. 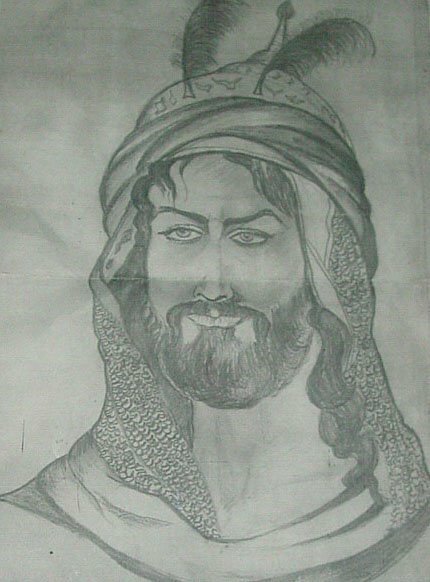 Later he revolted against Ali, became one of his opponents and joined the Khawārij. After some time he left the Khawārij also and went in seclusion. 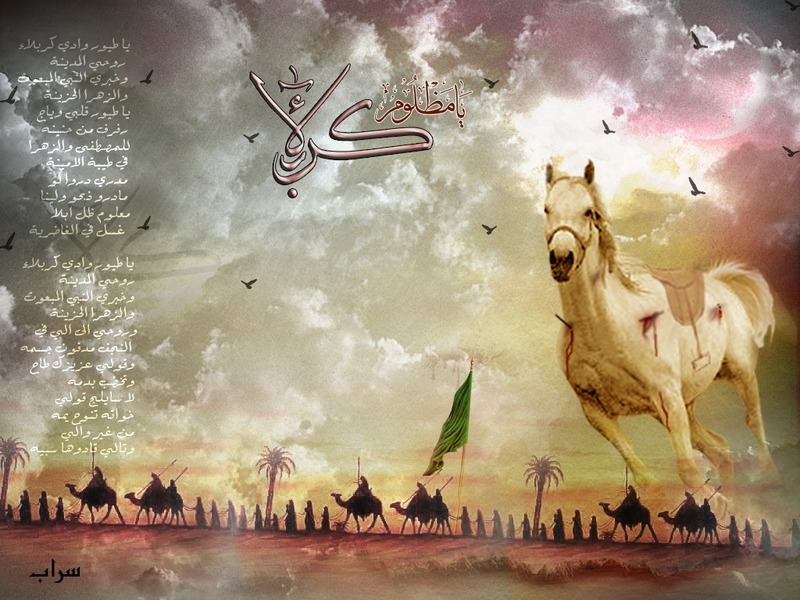 In 61 A.H. he participated in killing Imam Hussein and his companions with great savagery. 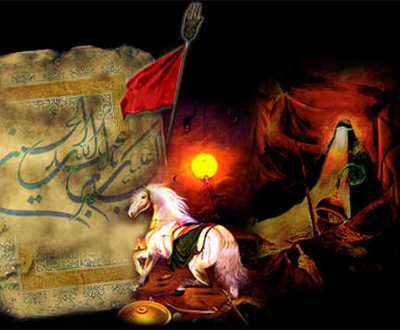 Afterwards when Mukhtār bin Abi Ubayd Thaqafi rose to avenge the murder of Imam Hussein, he (Shabath) who himself was one of the murderers of the Imam joined Mukhtār as an avenger of the Imam’s murder. Later he became the chief of Kufa police. He had a hand also in the murder of Mukhtār bin Abi Ubayd. He died in about 80 A.H.
How can those persons who do not have the least moral sense benefit from the celestial spirit of Hussein bin Ali and how can their untalented and corrupt souls receive any reflection of the sublime soul of the infallible Imam. The Imam continued his address till he said: “By Allah I will not swear allegiance to these people like weak and mean persons and will not flee the battlefield like slaves while fighting against the rascals. I seek refuge in Allah from the mischief of you people and of every arrogant person who does not believe in the Day of Judgment”. At dawn the Imam glanced over the army of Yazid and saw ‘Umar ibn Sa’d ordering his forces to march towards him. He gathered his followers and addressed them thus: “Allah has, this day, permitted us to be engaged in a Holy War and He shall reward us for our martyrdom. So prepare yourselves to fight against the enemies of Islam with patience and resistance. O sons of the noble and self-respecting persons, be patient! Death is nothing but a bridge which you must cross after facing trials and tribulations so as to reach Heaven and its joys. Which of you do not like to go from this prison (world) to the lofty palaces (Paradise)? 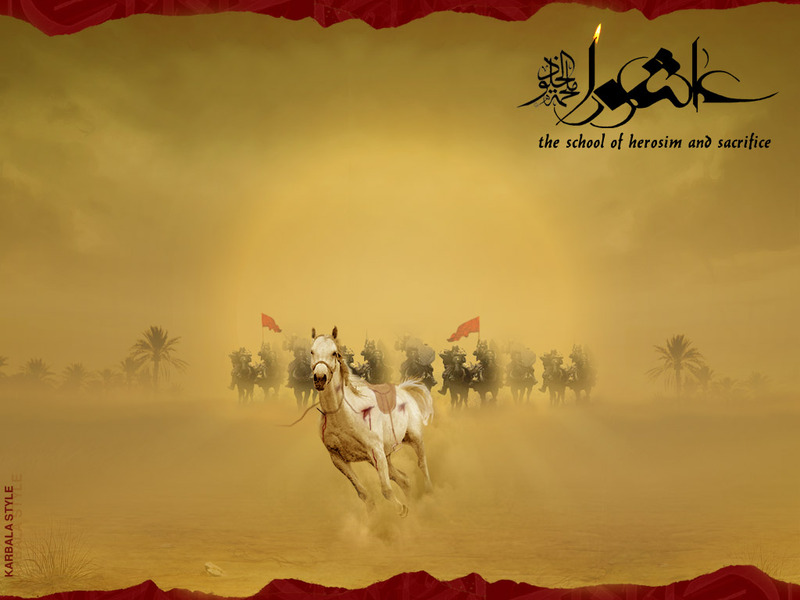 Imam Husayn sent out from his camp one after another to fight and sacrifice their lives in the way of the Lord. Lastly, when all his men and children had laid down their lives, Imam Husayn brought his six-month old baby son ‘Ali al-Asghar, and offering him on his own hands, demanded some water for the baby, dying of thirst. The thirst of the baby was quenched by a deadly poisoned arrow from the brute’s forces, which pinned the baby’s neck to the arm of the helpless father. At last when the six-month old baby also was killed, Imam Husayn addressed Allah: “O Lord! Thy Husayn has offered in Thy way whatever Thou hath blessed him with. Bless Thy Husayn, O Lord! with the acceptance of this sacrifice. After the wholesale, merciless and most brutal slaughter of the Holy Imam with his faithful band, the helpless ladies and children along with the ailing son of Imam Husayn, Imam ‘Ali Zaynul- ‘Abidin, were taken captives. Category: Muharram, Poems | 1 Comment on A Poem To Explain What Moharram Is All About.. In one of his speeches, Imam Hussein (AS) said that the authorities in Kufa had given him only two options – humiliation or death. He carried on to say ‘And we do not accept humiliation’. A tradition reported by Imam Sadiq (AS) records that, other than not accepting humiliation, Allah Almighty has given to believers a choice in all matters. Death is written for everyone and no soul may escape it. He said: Death is an adornment of life as a necklace is an adornment of a beautiful woman. Death with dignity is preferable to a life lived in humiliation. Dying for the cause of Islam is martyrdom and a great honour. In his farewell to relatives in Madina, Imam Hussein (AS) said: "Whoever joins us will be martyred, those who remain behind will miss the victory." Imam Hussein(AS) announced: ‘Don’t you see that Truth has been replaced by falsehood. We must be prepared to sacrifice everything that is precious in support of Truth!’ Truth is the essence of Islam and fortifies the values emphasized in the Holy Quran. Hazrat Ali Akbar asked his father Imam Hussein (AS). "Are we not supporting the Truth?" Imam (AS) replied in the affirmative Hazrat Ali Akbar (AS) said: "Then, it makes no difference if death comes to us or if we approach death." Fidelity is a characteristic admired by all. If friends meet in times of comfort and wealth but leave when hardship and difficulty strike, it is clear that their friendship is not true. On the day of Ashura, Imam Hussein (AS) told John, a servant of the renowned companion Hazrat Abu Dhar (AS) You have accompanied us all the way but now you may go. John replied: It is not fair that I benefit from your company and hospitality but abandon you in your hardship? His attitude exemplifies fidelity, loyalty and true friendship. The objective of all believers should be the pleasure of Allah Almighty. 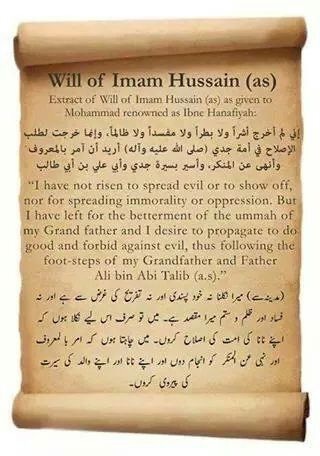 Imam Hussein (AS) said in one of his speeches that the only objective of the Prophet’s household is to please Allah. Allah tells us in the Holy Quran that only those who remain patient will receive reward without measure. Imam Hussein(AS) brought up to understand the Quran that is why he was happy to remain patience in hardship and endurance and to await his Lords reward. His patience wasn’t out of weakness or helplessness but a demonstration of his steadfastness and bravery. Those who saw Imam Hussein(AS) on the Day of Ashura reported: We have never seen a man remaining as composed as Imam Hussein a.s. whereas his relatives and children were slaughtered before his eyes. Imam Hussein(AS) tried to stop Umar ibn Saâd from pursuing his evil objectives. He said to him: You are promised government of Ray (Tehran today) yet you will never eat the wheat of that area. Ibn Saad responded: Its barley will suffice!! Realizing that he couldn’t change Ibn Saâds mind, Imam Hussein (AS) said: Those who use unlawful means to achieve their objectives never attain them.